Rachel Melancon and Allen Coats were very excited about the birth of their first child, a little girl they had named Olivia. When Olivia’s due date was near, Rachel asked for a C-section because she felt the size of her baby was too big for her tiny, 4’9”, 98 pound frame. Rachel’s physician, Dr. Backardjiev, ignored her request, and in fact, did not even engage in a meaningful discussion of alternatives to a C-section. He simply mentioned the cosmetic issue of a C-section scar. When Rachel struggled through labor for over 18 hours, unable to deliver her relatively large, malpositioned baby, feeling so tired she could no longer put much energy into pushing, Dr. Backardjiev still refused to perform the requested C-section and continued attempting a vaginal delivery. He used a very risky delivery instrument called forceps, which looks like metal salad tongs, with the tongs placed on each side of the baby’s head. Olivia’s heart rate kept going up. Again failing to discuss the risks and alternative delivery methods (including moving on to a C-section), Dr. Backardjiev pulled on and twisted little Olivia with the forceps in an aggressive attempt to get her out of the birth canal. At one point, Dr. Backardjiev placed his foot on the bed in an effort to give him more force in pulling on Olivia’s delicate head. Rachel and Allen shuddered as they “heard a pop, like clay cracking in pottery and heard her skull crush.” At that moment, they knew something had gone horribly wrong during the birth of their healthy little girl. In the end, after being put through so much trauma, Olivia had to be born by C-section. The baby girl didn’t cry, nor was she breathing. Olivia had to be resuscitated and she was put on a machine that could breathe for her. She was transferred by Life Flight to a different hospital, where the physicians told the heartbroken parents that Olivia had numerous skull fractures and a broken spine. Rachel and Allen were by their little girl’s side while she struggled on life support for five days. On day five, Olivia passed away shortly after being removed from her breathing machine. The grieving parents are devastated by the fact that their daughter is gone and that her traumatic injuries and death were completely preventable. The family is now suing Dr. Backardjiev, claiming that Olivia’s death is the sole fault of his negligent acts and failure to act during Olivia’s birth. Forceps delivery poses a high risk of traumatic injury to the baby. Experts agree that use of these risky delivery instruments should only be undertaken by physicians very skilled in their use. Strict standards must be followed, and it is negligence when physicians do not follow standards of care. In baby Olivia’s case, there were multiple contraindications to forceps use. First of all, it appears as though Rachel had cephalopelvic disproportion (CPD), which is when the baby is too big for the size of the mother’s pelvis, or the baby’s position makes her unable to navigate the birth canal. Indeed, being of small stature is a risk for CPD. When CPD is present, use of forceps is contraindicated and the baby must be delivered by C-section. Rachel therefore should have had a C-section, and not a contraindicated forceps delivery. In addition, the use of forceps must be abandoned if descent of the baby does not easily occur with appropriate force, and it also must be stopped if the baby has not been delivered within a reasonable period of time. Both of these conditions were occurring, and the physician should have instantly stopped the procedure and performed an emergency C-section. The fetal presentation, position, lie and any head tilt must be known. If any of these are uncertain, an ultrasound should be performed. If ultrasound is not available, no more than one-fifth of the fetal head should be palpable abdominally (felt when touching mother’s abdomen) if the vertex is engaged. The risks of the procedure and alternatives must have been fully explained to the mother. The physician must have experience and be skilled in the use of forceps. There must be a willingness to abandon attempts if the forceps are not working / labor is prolonged. The cervix must be fully dilated. The membranes must be ruptured. The baby’s head must be engaged. The fetal size must have been estimated, with clinical pelvimetry showing adequate dimensions and no obstructions or contractures. Maternal anesthesia must be satisfactory. Maternal bladder must be empty. The baby is less than 34 weeks gestation. A forceps delivery should be abandoned if descent of the baby does not occur with appropriate application and traction, and delivery should occur by the third pull. It is critical for the physician to be willing to abandon a forceps delivery and have the ability to perform a prompt C-section. Descent does not easily proceed with appropriate traction. It is or becomes difficult to apply the instrument. The baby has not been delivered within a reasonable time. Nerve damage. Improper use of forceps can result in nerve damage to the side of the baby’s face, which can cause facial nerve palsy. Head and facial trauma. Inappropriate use of forceps can result in trauma to the baby’s head, which can lead to hypoxic ischemic encephalopathy (HIE), cerebral palsy, seizures and other forms of brain damage. If a mother undergoes a procedure to which she did not give informed consent, the physician performing that procedure has acted negligently. Informed consent means that the physician has fully explained the procedure to the mother, including the risks of and alternatives to the procedure. In this case, the Dr. Backardjiev flatly told Rachel that she could not have a C-section delivery. This is one of the alternatives that must be explained to the mother before forceps are used. Rachel no doubt would have consented to a C-section delivery since she requested it prior to labor. The physician must be prepared to quickly move on to a C-section delivery when a forceps delivery is not progressing as it should. Some conditions that require the baby to be delivered immediately include fetal distress, uterine rupture and cord prolapse. Sometimes physicians fail to perform an emergency C-section when one is indicated, or they wait too long to perform one. Other times, the C-section may be ordered, but the physician lacks skill in the procedure, or the hospital is ill-equipped for it. Delay in performing a C-section can lead to permanent injuries in the baby, such as cerebral palsy and hypoxic ischemic encephalopathy (HIE). Indeed, in many cases – such as CPD – a C-section is the safest way to deliver the baby. Thus it is critical that physicians be skilled and prepared for the procedure. In certain situations and when properly used, forceps can be helpful during birth. Due to the risks involved, however, it is imperative that physicians be very skilled in their use. Physicians must be ready to move on to a C-section delivery when forceps use is not proceeding as it should, and standards of care must be followed at all times. Failure to act skillfully and in a timely manner during delivery is negligence. It also is negligent when physicians or medical personnel fail to follow standards of care. If negligence leads to injury of the mother or baby, it is medical malpractice. 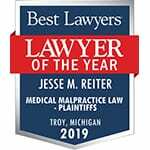 If your baby suffered any birth complications and has been diagnosed with injuries such as HIE and cerebral palsy, please contact the nationally recognized birth injury attorneys at Reiter & Walsh ABC Law Centers. For over 25 years, our skilled attorneys have been helping families in Michigan and throughout the nation whose children have birth injuries. We have numerous multi-million dollar verdicts and settlements that attest to our success, and we will fight to obtain the compensation you and your family deserve for lifelong treatment and a secure future for your child. We will evaluate your case to determine if your child suffered injuries due to the negligence of the physician or medical staff, and you never pay any money until we win your case. Email or call us at 888-419-2229.